Headstamp Publishing is a specialist publisher producing authoritative books on arms, munitions, and military history. Drawing on an extensive network of subject matter experts and unprecedented access to top-tier collections around the world, we aim to deliver best-in-class books, combining exceptional research and technical accuracy with the latest in high-quality production and photography techniques. Headstamp Publishing was founded by N.R. Jenzen-Jones (Director, Armament Research Services), Ian McCollum (of Forgotten Weapons fame), and James Rupley (the Co-Founder and Creative Director of the popular Vickers Guide book series). We are committed to producing books that showcase world-class authors, technical specialists, photographers, and editors. N.R. Jenzen-Jones is a military arms and munitions specialist and intelligence analyst focusing on current and recent conflicts and weapons technologies. As Headstamp Publishing's Director of Research, he coordinates authors, technical reviewers, subject matter experts, and editors to ensure all publications meet our rigorous content standards. In addition to his work with Headstamp, Mr. Jenzen-Jones is the Director of Armament Research Services (ARES), a specialised technical intelligence consultancy, a Visiting Fellow at the Centre for the Reduction of Firearms Crime, Trafficking and Terrorism at the University of Northampton, and serves in consultancy roles with a number of prominent organisations in the field. He has produced extensive research and analysis on a range of small arms and light weapons (SALW) and small and medium calibre ammunition issues, and has also provided technical assessments of incendiary weapons, cluster munitions, indirect-fire artillery weapons, and conventional arms proliferation. He is a certified armourer and ammunition collector, and a member of several professional organisations. Ian McCollum is the founder, editor, and presenter of Forgotten Weapons, a decade-old web site and video archive dedicated to preserving firearms history. As a Subject Matter Expert with Headstamp Publishing, he helps to ensure the factual accuracy of firearms information contained within our publications. In addition to being an avid practical shooting competitor, Mr. McCollum studies the history of firearms development as well as their practical use, with a particular interest in the developmental stages of manually repeating and self-loading arms. He holds a degree in Mechanical Engineering Technology from Purdue University, a NIMS Level 1 CNC operator’s certificate, and has worked in firearms manufacturing as well as having lectured for the Association of Firearm and Toolmark Examiners (AFTE). Mr. McCollum also continues to produce significant original research with Armament Research Services (ARES). His work with firearms includes a particular speciality in French arms which has led him to a deep interest in collecting these weapons. His book on this topic, Chassepot to FAMAS: French Military Rifles, 1866 – 2016, will be released by Headstamp in 2019. James Rupley is a professional photographer, practicing attorney, hunter, fisherman, and amateur competitive shooter. As Headstamp Publishing's Creative Director, Mr. Rupley is responsible for ensuring that photography, layout, design, and printing all meet our exacting quality requirements. A graduate of The Citadel (The Military College of South Carolina) and Tulane University Law School, he has practiced law in New York City and has served as in-house counsel for a retail and wholesale business. Mr. Rupley is licensed to practice law in New York and Tennessee, and he is the co-founder and producer of the Vickers Guide series of high-end coffee table reference books, in partnership with U.S. Special Operations combat veteran Larry Vickers. He has published six critically acclaimed books, and his photography and other creative product have been featured in a multitude of media outlets. Mr. Rupley also holds a commercial drone pilot license through the U.S. Federal Aviation Administration. 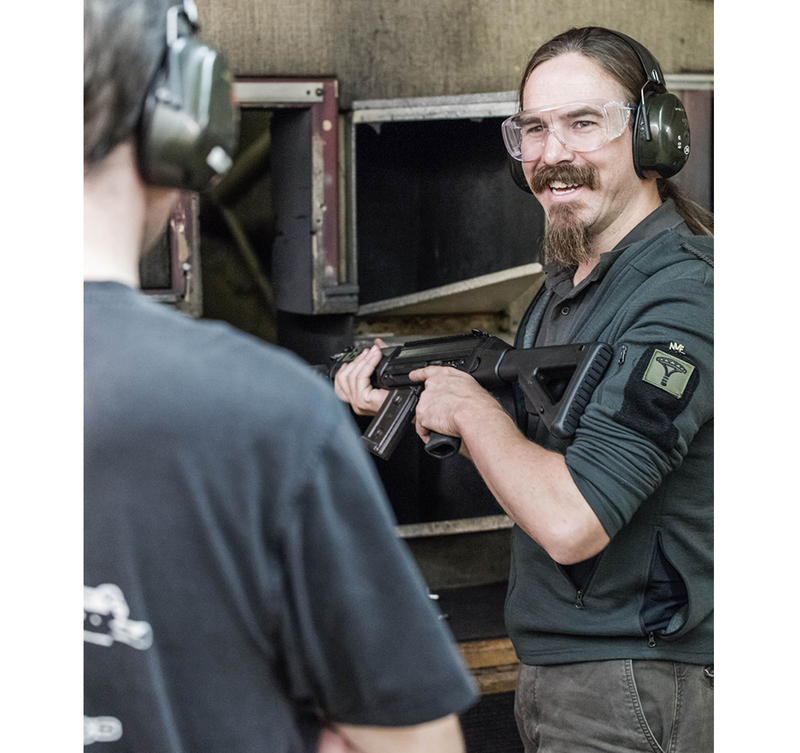 Jonathan Ferguson is Keeper of Firearms & Artillery at the Royal Armouries Museum in the United Kingdom and a Technical Specialist with Armament Research Services (ARES). He is responsible for curating a collection which spans the full history of firearms, from the handgun of medieval times to the latest modular assault rifles. Through his role with ARES, Mr. Ferguson provides Headstamp Publishing with subject matter expertise and technical review. He is a specialist in the identification of small arms and light weapons, including identification solely based on component parts or weapon fragments. Mr. Ferguson has published various articles and books; his next title will be published by Headstamp in 2019.